Millers Creek has numerous eroding banks. Soil erosion results in soil being detached, carried away, and eventually deposited elsewhere. It is a natural process, and rivers and creeks naturally hold soil, deposit it in some places and pick it up in other places. In the Huron River Watershed, soil erosion is a problem when it is accelerated because of high water flow and human disturbance (i.e. farming, construction) of the land surrounding our streams. 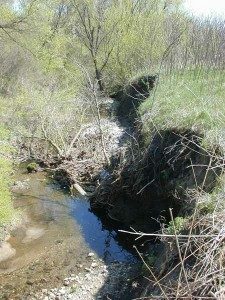 When the amount of soil in the creek exceeds the ability of the water to transport it downstream, the excess soil can clog rocks and gravel beds, which are important habitat for fish, insects, and other river life. When excess soil drops out of the water and remains in the stream, the process is known as sedimentation. Naturally occurring factors also influence both the rate and the amount of erosion and deposition into streams. 1) Vegetation is the most important physical factor influencing soil erosion. A good vegetative cover binds the soil together, infuses it with organic matter, shields it from rain, makes it resistant to runoff, and filters sediment. A robust vegetative cover is one of the best protections against erosion. 2) Climatic conditions influencing erosion include the amount, intensity, and frequency of rainfall, and hot and cold temperatures. For example, during periods of frequent rainfall there is a greater percentage of runoff. And, while frozen soil is highly resistant to erosion, rapidly thawing soil can lead to increased erosion. 3) Soil characteristics also determine erodibility. One of these characteristics is texture – the size or combination of sizes of soil particles. They fall into three broad classifications ranging across small (clay), medium (silt), and large (sand). Soils most susceptible to erosion are those with the largest amount of medium (silt)-size particles. Clay and sandy soils are less prone to erosion. 4) Ground slope – its combined length, grade, and surface quality (rough or smooth) – affects erodibility. The longer the slope, the steeper the grade, and the smoother the surface, the larger is the potential for erosion. Along with quantity of rainfall, slope characteristics determine the speed of flow. The faster the water flows, the greater the potential for erosion and sedimentation. Environmental scientists estimate that, from all sources, more than 4.5 billion tons of sediment pollute the rivers of this country each year. This volume is equivalent to 25,000 100-yard football fields stacked 100 feet high. Experts also estimate that we spend somewhere between $6 and $13 billion in the United States each year to correct the effects of erosion and sedimentation.